When buying a home, there are always a series of questions that run through a home buyer’s mind. 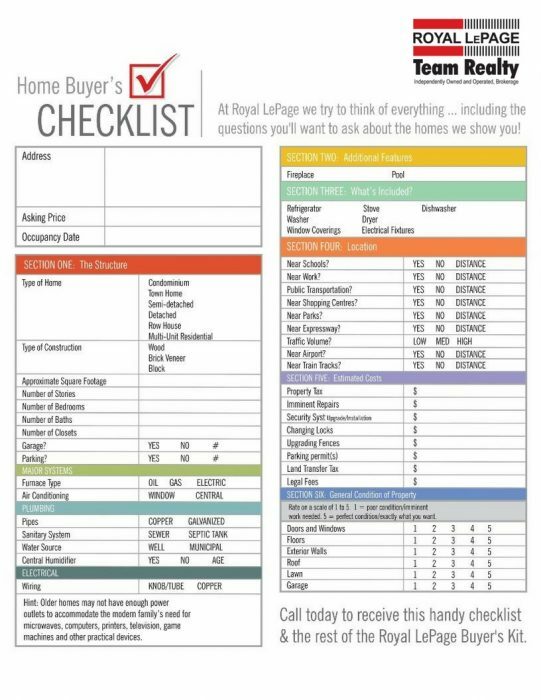 At Royal LePage Team Realty, we encourage you to ask them, we try to think of everything for you … including a checklist to keep track of the important details about homes we show you! Of course your Real Estate agent will be there every step of the way to help you find the right home, but falling in love with a property is not the only factor to consider when purchasing a home. We’ve put together a checklist that outlines details that are important to many buyers and will help in your decision to make an offer on a property or move on to the next. It includes such attributes as the structure of your home (examples: detached, semi-detached, condominium, etc. ), the type of construction of your home (examples: wood, brick veneer, or block), as well as several detailed inquiries regarding your furnace, your plumbing, and your home’s electrical wiring. Furthermore, it’s important to know what your home comes equipped with. For example, what’s already included in the price of the home? Are the appliances up to date? Are there any additional features such as a fireplace or a pool? Some of the biggest questions you may find asking on your checklist are those regarding the location of your home. If you are someone who travels to and from work every day, it’s essential to make note of nearby transportation routes (examples: bus routes, highways, traffic volumes etc.). Do you have kids? If so, parks, schools, and other amenities such as shops and restaurants will be features you’d like to check-off your list. You’re almost there, you’re about to sign the papers. In addition to the above mentioned features, it’s important to ask about any additional estimated costs that will come with your home upon purchase, as well as the condition of such attributes as your floors, roof, windows, and so on. What are the property taxes? Are there any imminent repairs? Does your home require a parking permit? Download our checklist below, it will put your mind at ease from submitting an offer to move-in day! The post Checklist for Home Buyers appeared first on Team Realty.